The Chiba Prefectural Government has opened a Facebook page featuring the prefecture’s mascot CHI-BA+KUN, named “CHI-BA+KUN Taiwan Fan Club,” dispatching information and introducing the prefecture’s attractions in an effort to increase the prefecture’s name recognition and improve its image in Taiwan. 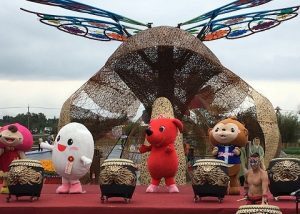 (1) CHI-BA+KUN introduced Chiba’s attractions at the Taoyuan Agriculture Expo on April 22. “I stood on stage with Taoyuan city’s mascots Tao & Yuango and others. It was a lot of fun,” CHI-BA+KUN said on the page. (3) CHI-BA+KUN celebrated his 11th birthday on January 11. A birthday party for CHI-BA+KUN was held at Mitsui Outlet Park Kisarazu in the Chiba Prefecture city of Kisarazu. (4) CHI-BA+KUN introduced the tourist attractions of the Chiba Prefecture city of Minamiboso on March 14, including a park where visitors can enjoy picking flowers and viewing a scenic park. – “Tomiura Biwa Club,” a roadside station in Minamiboso, has the area’s largest field mustard garden on its premises. Visitors can also enjoy picking strawberries and loquats at the facility. – Approximately one million poppies are in full bloom at Tateyama Family Park’s flower-picking field.